Diamond ring enhancers are a beautiful, elegant way to accentuate a simple engagement ring design. It is important not to use just any enhancer, however, but one that will truly add to the beauty of the piece without making it gaudy or ostentatious. Many people love the beauty of a simple diamond solitaire engagement ring, while others want a bit more glitter on their finger. It may be that the couple could not initially afford a multi-stone diamond engagement ring, or choosing a diamond ring wrap may be a suitable anniversary gift or token for another special occasion. 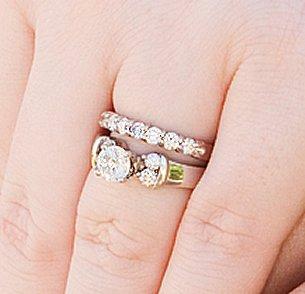 Many brides-to-be even choose enhancers to serve as diamond wedding rings, adding more distinction to the initial ring. What is enhancing to one couple may be gaudy or overdone to another, however. The overall effect depends on the initial style of engagement ring as well as what details are added with the additional ring. Different styles of enhancers add different features, any of which can help create an even more gorgeous and meaningful ring. Dual wraps that circle both sides of the ring, effectively turning a single ring into three diamond-studded bands. Side wraps that line one edge of the initial ring, often with channel set accent stones. Circle guards that literally "wrap" around the center stone and add accents symmetrically to either side of the gem. These may be full or partial diamond ring guards depending on the style and the shape of the center stone. Choosing effective and beautiful diamond ring enhancers is more than simply picking a style, however. Several considerations must be made when enhancing a ring by adding a stone enhancer. Balanced Sizes. A one carat diamond engagement ring will appear disproportioned to a very small, diamond chip enhancer, while a one-fifth carat stone may be overwhelmed by the same wrap. The best way to effectively balance sizes is to create a total carat weight no greater than 175-200 percent of the center stone. Complementary Shapes. Round diamonds are fairly universal as accents for any stone shape, but more specialized shapes may be better suited to unique accent stones. Princess cut stones, for example, are superb accents for emerald cuts or Asscher cut engagement rings because the sides will fit firmly together without gaps. Trilliant shapes similarly compliment pear shaped diamond engagement rings. Similar Metals. Because the two rings are meant to blend seamlessly together, the metals should ideally match. Choosing contrasting metals will highlight the different rings, which may be desirable if the end result is meant to be a two tone ring. Appropriate Fit. Depending on the size and shape of the center stone, the enhancer may be too tight or too loose for a good fit. Too tight a fit may cause inadvertent damage to the engagement ring, while a too-loose ring will wobble and may be uncomfortable to wear as well as more prone to loss. By choosing diamond ring enhancers that appropriately fit and compliment the initial ring, it is possible to use these accents as stunning upgrades to any engagement ring. Couples with very unique engagement rings or custom engagement rings may not be able to find a suitable enhancer. In this case, there are several alternatives that can add distinction to an engagement ring without the cumbersome additional band. Simply upgrading your engagement ring is the easiest way to enhance it without another ring. The center stone can be reset into a semi mount diamond ring with built-in accent stones. If the ring is not curved or otherwise shaped, adding a diamond infinity ring or other style of anniversary ring can make it exceptional without a permanent change. For a more subtle enhancement, the ring could be engraved with a personalized sentiment. Diamond ring enhancers are a lovely way to add beauty and flair to an engagement ring without losing its initial beauty and sentimentality. By choosing the appropriate type of enhancer, any simple ring can become simply gorgeous.